Nicole, Mack and the GCB. Marvin's -- the Greencastle eatery that famously "delivers anywhere" -- has made some noteworthy "deliveries" over the years. There was that time students unfurled a "Marvin's delivers" sign on Red Square in Moscow and found themselves in some Cold War hot water. Eiffel Tower? Been there, done that. Grand Canyon, Grand Rapids, Grand Cayman? You betcha. Or the hundreds of Winter Term excursions in which the signs have made their way to Aruba, Jamaica and Kokomo. But none of those really actually delivered the famous GCB's -- aka garlic cheeseburgers -- to their exotic destination. Where's the beef? Not in these photos. So we decided to go those deliveries one better last week when Daughter No. 2 gave birth at the Columbus hospital to the first boy in my family since ... well, me. We pulled off the Marvin's delivers to the delivery room move. Of course, this took slightly less planning than the Normandy invasion to execute, especially with Marvin's closing at 10 p.m. on weeknights prior to the return of students. Let's backtrack a second. Baby boy Mack -- as in Joseph Mack, who I plan to call J-Mack -- was born just a bit early. Like three weeks. 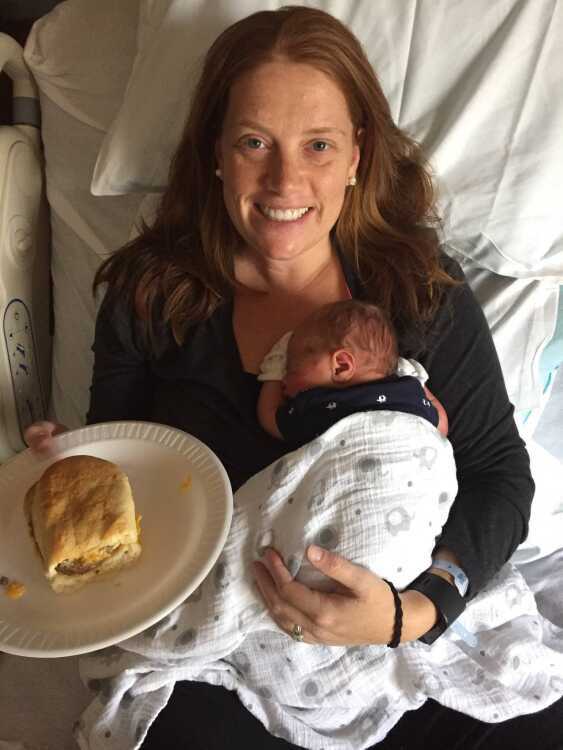 He wasn't supposed to burst onto the scene until -- fittingly enough, Labor Day (Sept. 5) -- which would have been odd for me,what with an ex-wife whose birthday was exactly that, Sept. 5 and born on Labor Day, so I could be there to see my first grandson born. But J-Mack decided he'd been cooped up long enough last Tuesday (Aug. 16) and forced the issue. Daughter Nicole and husband Joe were en route from their North Vernon home to a doctor's appointment in Columbus when a detour to the hospital became necessary. I knew nothing of this until Daughter No. 1 called from her car somewhere near Omaha (insert your own Peyton Manning "Omaha! Omaha!" audible joke here). "We have a baby!" daughter Kara announced, totally perplexing me since I knew nothing of the Columbus excursion or the hospital detour and thought I'd somehow been left out of the baby loop. After all, I'd been keeping my calendar free around Labor Day. So Kara began her 10-hour trip to Greencastle, hoping to arrive for a late dinner at Marvin's, and a trip the next morning to Columbus. When it became obvious she wasn't going to make Greencastle by 10, I decided I'd scramble over to Marvin's just before they closed and buy us dinner to take to my house. That's when the lightbulb went off and my GCB order jumped from two sandwiches to five. That way we could put three GCB's in the fridge and have a surprise Marvin's-delivers-to-the-delivery-room lunch with Nicole and Joe. Needless to say, that GCB surprise was the second greatest thing to happen in that hospital room last week. While we didn't unfurl a bedsheet with "Marvin's delivers" on it, we did deliver the goods.